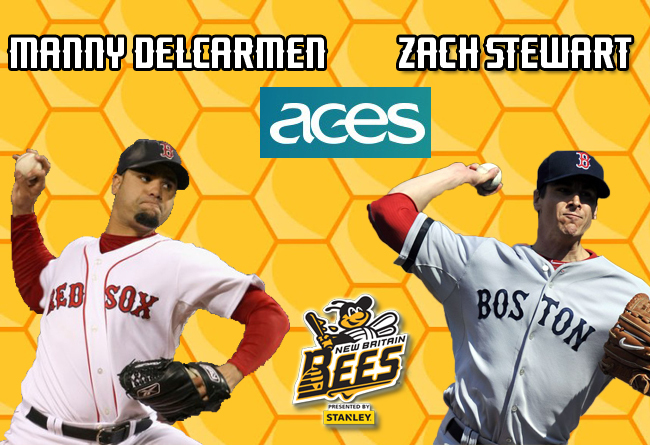 (New Britain, Conn., March 20, 2018) – The New Britain Bees today announced the signings of pitchers Manny Delcarmen and Zach Stewart. Manny Delcarmen comes to New Britain for his 18th year of professional baseball and second in the Atlantic League. Last season, the World Series Champion appeared in 59 games for the Bridgeport Bluefish, posting a 3-2 record with a 4.40 ERA, 54 strikeouts, and nine saves in 57.1 innings pitched. The Massachusetts native was selected by the Boston Red Sox in the second round of the 2000 MLB draft, and made his professional debut the following year with the Rookie-level Gulf Coast Red Sox of the Gulf Coast League. He spent ten seasons with the Red Sox organization, making his big league debut in 2005 after being called up from Triple-A Pawtucket of the International League. He went on to win a World Series ring with the Red Sox in 2007. That year, he was an integral member of the team, tossing 44.0 innings and striking out 41 batters with a 2.05 ERA. In 2010, he joined the Colorado Rockies, and has also spent time with the Seattle Mariners, Texas Rangers, New York Yankees, Baltimore Orioles, and Washington Nationals organizations. In 298 career Major League games, the pitcher owns a 3.97 ERA with 249 strikeouts across 292.2 innings. In 390 career minor league games, Manny has collected a 3.85 ERA with 695 strikeouts in 693.1 innings pitched. Zach Stewart joins New Britain for his 11th year of professional baseball and first in the Atlantic League. Last year, the former big leaguer appeared in seven games for Triple-A Norfolk (Baltimore Orioles) of the International League. Prior to that, he spent two seasons in the Korean Baseball Organization with the NC Dinos, where he started 46 combined games and compiled a 20-10 record with a 3.73 ERA and 227 strikeouts over the course of 267.2 innings pitched. The 31-year-old was originally drafted by the Cincinnati Reds in the third round of the 2008 MLB amateur draft. The following year, he was traded to the Toronto Blue Jays as part of a deal for Scott Rolen. The righthander would spend a couple seasons in the Blue Jays organization before making his Major League debut with Toronto in 2011. He would also spend time in the big leagues with the Chicago White Sox and Boston Red Sox. Overall, he appeared in 33 Major League games (14 starts), recording three wins and 64 strikeouts in 101.0 innings of work, including a complete game shutout of the Minnesota Twins on September 5, 2011, where he only allowed one hit and struck out nine batters. He holds a record of 55-53 with a 3.73 ERA and 806 strikeouts over the course of 1,035.2 innings in 227 minor league appearances (169 starts).